The following artwork was created by H. I. Sutton and it was included in his excellent article published on June 18 of this year entitled The Gods of M.A.D.ness which analyzes the Nuclear Ballistic Missile Submarines that are in service nowadays. 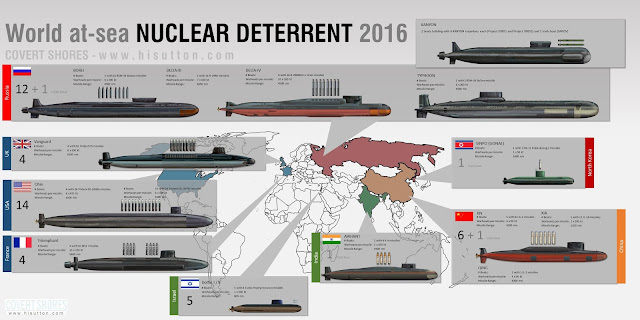 Just click on the previous title to learn all the amazing details regarding the current ballistic missile submarines in world's navies as well as other great infographics about submarines in general but especially about submarines designed for special purposes such as Swimmer Delivery Vehicles (SDVs), midget subs and similar craft. For other infographics and information in this blogger-page about Nuclear Ballistic Missile Submarines click here or just the appropriate label. Today's World's Ballistic Missile Submarines. High resolution image here. Specifications of World's Ballistic Missile Submarines.